[dropcap style=”font-size: 60px; color: #0099FF;”]L[/dropcap]ieutenant Colonel Alan L. Bonner will assume his new position as National Executive Director of the National Honorary Band Fraternity & Sorority, Kappa Kappa Psi and Tau Beta Sigma, headquartered in Stillwater, Okla., this spring. He is the former commander and conductor of the United States Air Force Band from Washington, DC. His four years at the helm of the Air force’s premiere band culminates a 26-year career in the Air Force. During his career, he has led bands in Illinois, Florida, New Jersey, California, Texas and Nebraska. 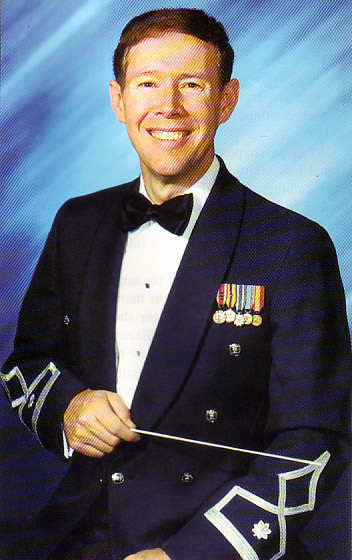 In addition to directing hundreds of concerts on tours throughout the United States and abroad, Colonel Bonner led the Strategic air command Band on a six-nation tour of the Persian Gulf on a special mission to support our troops in the United Nations’ Desert Shield/Desert Storm Operation. Originally from Idabel, Okla., he is a 1969 graduate of the University of Oklahoma with a bachelor of music educati on degree. In 1981 he earned a master of music degree from the University of Soutb Florida in Tampa. Colonel Bonner is also a graduate of Squadron Officers School, Air Command and Staff College, and tbe Air War College. His professional affiliations include the American Bandmasters Association, Music Educators National Conference, the College Band Directors National Association, and tbe National Band Association. Colonel Bonner retires from the Air Force this spring. He currently resides in Alexandria, Vir., with his wife, Jennifer, and two of their three daughters, Megan and Beth Ann. Their eldest, Kelly, is a freshman at the University of Florida in Gainesville.